It is often quoted that ‘Learning starts in infancy, long before formal education begins and continues throughout life’. Learning is a lifelong process and our students should grow to become lifelong learners. We believe that every child has the potential to bring something unique and special to this world. Thus, at Shail Global School (SGS) we deem to develop the potential of children by believing in them as capable individuals. We are committed to provide a safe and physically comfortable learning environment to ensure that all students receive value education and life skills that will allow them to take next step in their lives when they leave the school. At SGS, we endeavor to offer the very best of teaching and learning that has been specially tailored to meet the needs and aspirations of the young in the modern world where technology is ever advancing. Towards this, all activities have been integrated with the curriculum. 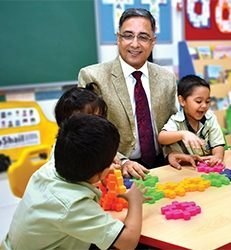 To develop strong foundations and understanding of concepts, the school has adopted the STEM (Science, Technology, Engineering and Mathematics) programme which essentially results in conceptual understanding rather than rote learning. Here, the teacher’s role is to guide and provide access to information so that the student’s search forknowledge is met as they learn to find answers to their questions. From the very beginning, students are provided access to hands-on activities and are allowed adequate time and space to experiment so that reinforcement of the lesson being studied takes place. This enables students to develop fascination and interest for science and mathematics from an early age. At SGS, the highly skillful and consummate faculty has a clear vision to ensure that right from the day of induction, the young ones will be moulded into future torchbearers in the fields of science, technology and management. Besides, emphasis is laid in the school to promote diversity, encourage creativity, provide leadership opportunities and develop self-confidence. From the foundation itself, stress is laid on achieving proficiency in languages and vocabulary including fluency in English so that students grow to become excellent communicators and develop personal aura and presentation.